Several interviews on the ‘politics of oil and water’ are featured this week on Big Think, a website of ideas from people on everything including the environment. The following people and others were asked about “access to oil and water as a human right, sources of alternative energy and the future of global conflicts over resources”. Maude Barlow, founder of the Blue Planet Project. Michael Klare, professor and author of Blood and Oil. Robert Bryce, Fellow at the Energy Resource Institute and author of Gusher of Lies: The Dangerous Delusions of ‘Energy Independence’. As the Council of Canadians website states, on October 16, 2007 a new book will be available by Maude Barlow acclaimed water activist, scholar, and chair of the Council of Canadians. 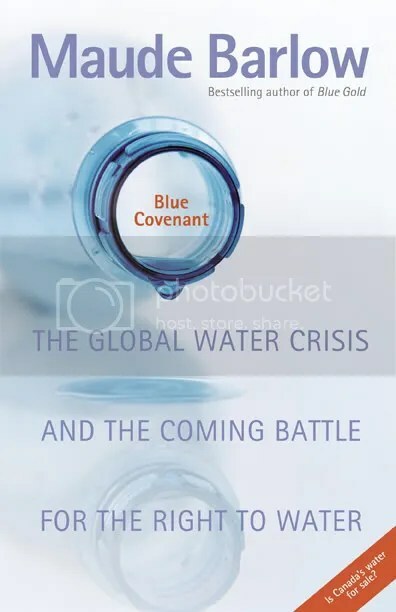 Her new book is called: Blue Covenant: The Global Water Crisis and the Coming Battle for the Right to Water. Maude Barlow will also touring Canada to promote this book from October 17 to November 22. Please see the Council of Canadians website for more information about the exact locations of her tour schedule.